Section D involves the construction of a new 26km four-lane bypass of Gympie, running east of the city, close to the railway line until Old Maryborough Road. It will then travel through the edge of Curra State Forest to minimise the impact on private land. 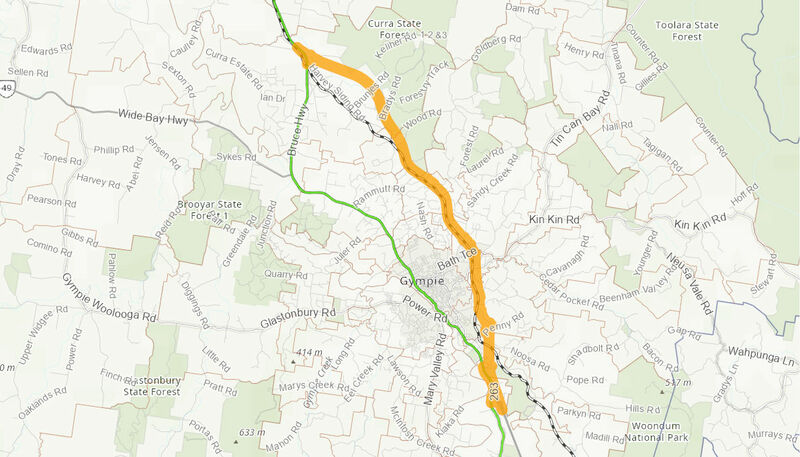 Section D is the final link in the 62km upgrade to the Bruce Highway between Cooroy and Curra, and will connect to the Section C (Traveston to Woondum), with the existing Bruce Highway at Curra, north of Gympie. Realising the full benefits of the upgraded corridor (Cooroy to Curra Upgrade projects A, B & C) as a whole, as it completes the construction of a connected flood protected corridor and bypasses the Gympie town centres. Reduced congestion, supporting efficient regional freight and local traffic movements and improved network travel times. Reduced number and severity of road crash incidents. Reduced disruption to community and economy from flood events. Increased link capacity supporting economic and social growth. Improvements to local amenity in the Gympie urban area. The project will reduce the pressure for intersection upgrades along the existing highway through Gympie. The Australian Government has committed up to $52 million towards the $65 million planning only project, in partnership with the Queensland Government. No Australian Government commitment has been made to the construction of the Section D project. The planning and detailed design phase of the project commenced early 2016 and is scheduled to be completed early 2019.